Earn up to 12,400 reward points. Japanese-built rosewood and spruce combo with traditional tobacco sunburst finish. The PTU241C dreadnought was built in Takamine's Japanese factory in Nakatsugawa. 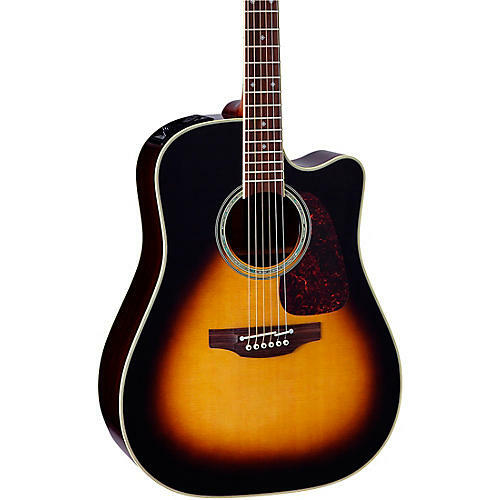 It features a solid Sitka spruce top and solid Indian rosewood back and rosewood sides. The top features a brilliant gloss tobacco sunburst finish, with the rest of the guitar being finished in gloss natural finish. The neck is made of tropical mahogany with a rosewood fingerboard inlaid with delicately detailed diamonds. The body, fingerboard and headstock are bound in grained ivoroid binding. This guitar features the CT4B II preamp, being fed by Takamine's legendary Palathetic pickup, ensuring great performance acoustically, or amplified on stage. Order this all-solid dreadnought today.